Background/Objectives: Interoperability among the hospitals is the major challenge in development and deployment of the clinical reporting system.In this paper, we demonstrate a HL7 (Health Level) FHIR (Fast Healthcare Interoperability Resources) standard to provide the interoperability among the healthcare information system. Method/Statistical Analysis: FHIR (pronounced ”fire”), is successor of the HL7 v3 standard. FHIR can utilize the light weight devices and is based on REST architectural. 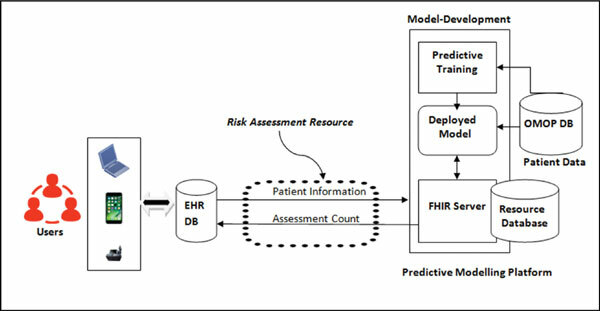 Model integrated with the EHR (electronic health record) that store Mongo DB database and reports is generated through FHIR resources. Various authentic individuals like physician, staff, patient and family members of patient can access and update the report. On the basis of the report, the model can provide the prediction of the disease. Findings: In our study, we examined dataset PIDD (Pima Indian Diabetes dataset) for the model. Dataset trained offline using the predictive techniques SVM, Naive Bayes and K-NN. Performance analysis was performed on the basis of response time and waiting time of a request. Application/Improvements: Open source standard, technologies like FHIR and MONGO DB can play a prominent role in healthcare system and in the area of clinical research. Integrating the EHR with web services assists the physician for making the correct decision at right time. Fast Healthcare Interoperability Resources (FHIR), EHR (Electronic Health Record), K-NN, SVM techniques, Public data set, RESTful.